Submitted photo “The Liar” will run Friday, Nov. 30 through Sunday, Dec. 9. 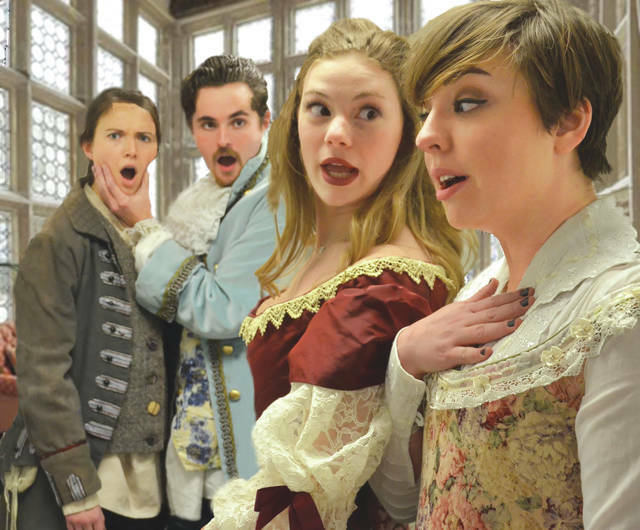 FAIRBORN — Wright State University Theatre will present an adaptation by David Ives of Pierre Corneille’s comedy, “The Liar,” beginning Friday, Nov. 30 through Sunday, Dec. 9 in the Herbest Theatre. According to a press release by Wright State Theatre, Dronte, a pathological liar, says whatever he can to get the attention, and the hand of Clarice, a fetching young lady. Oh, but is he smitten with Clarice, or her friend, the shy Lucrece? In the middle of trying to piece that puzzle together, come new complications. Such as Alcippe. Clarice’s secret fiancé, and by happenstance, Doronte’s old friend. But wait, there’s more — unbeknownst to Doronte, his father, Geronte, is trying to secure a marriage between Doronte and Calrice. “The Liar” is directed by Josh McCabe, – “The Memory of Water” and 13-year company actor and senior education artist at Shakespeare and Company. The set is designed by MacKenzie Perin, costumes by Taylor Dumas, lighting by Jera Lauderdale, and sound design by James Dunlap. The dialect coach is Deborah Thomas and fight director is Bruce Cromer. On the stage, this production features Isaac Ingle as Doronte; Christine Fiala as Clinton; Kenneth Erard as Geronte; Lauren Kampman as Clarice; Caitlyn Shiner as Lucrece; Louie Kurtsman as Alcippe; George Heddleston as Philiste; and Mallory Kraus as Isabelle and Sabine. “The Liar” opens 8 p.m. Friday, Nov. 30, with additional performances scheduled for 8 p.m. Dec. 1 , 7-8; and 2 p.m. Dec. 2, 8-9. Tickets are $15 for adults; $10 for senior citizens and $5 for students. For tickets and theatre information call the Box Office at 937-775-2500 12-4 p.m. Monday-Friday, or purchase single tickets online at http://www.wright.edu/tdmp. https://www.fairborndailyherald.com/wp-content/uploads/sites/50/2018/11/web1_WSU-LIAR-PR-2.jpgSubmitted photo “The Liar” will run Friday, Nov. 30 through Sunday, Dec. 9.